The Administration Division provides for the personnel and financial administration of the department. This division facilitates compliance with city personnel policy and state and federal employment regulations, processes accounts receivable and payable, payroll, personnel record entry, database management, information systems requests, and front counter customer service. division comprises the greater majority of the preparedness and response budget for equipment, personnel, and maintenance. The Firefighting and Rescue Division handles a broad set of core preparedness and response responsibilities. Moreover, this division supports the first response role for the Ambulance Division. The Ambulance Fund was established in 1998 to account for all transactions that pertain to ambulance services. Funding sources for the fund are user fees assessed for ambulance services. In 2012 the Ambulance Fund will not use any tax levy. User fees are now covering 86% of the ambulance fund expenses in the 2012 budget and the remainder is covered by ambulance fund balance. 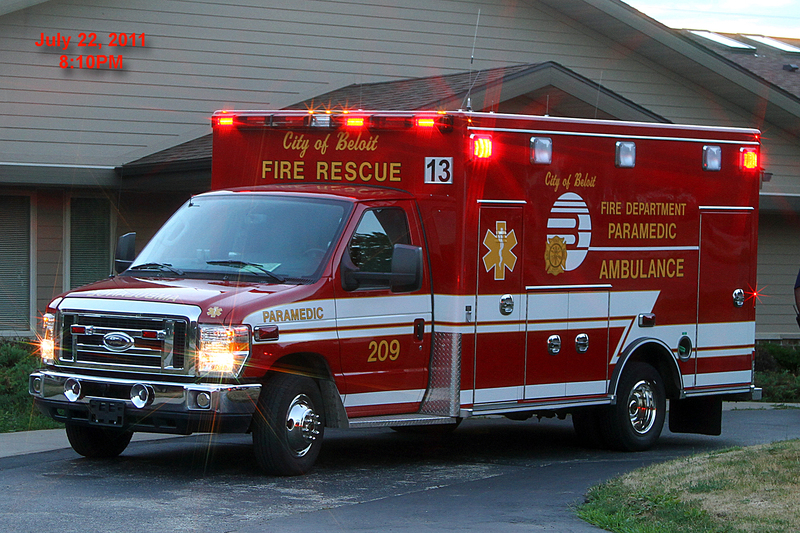 This Division provides Advanced Emergency Medical Services care and transport for residents and visitors of Beloit. It provides a Paramedic level of service with a Paramedic Engine First Response concept, and transport with two Paramedic ambulances, and one Emergency Medical Transportation Basic Ambulance. This program provides for a portion of personnel and all of the equipment, maintenance costs for the program. This program also supplements the all hazards response mission of the Firefighting and Rescue Division. The Code Enforcement Fire Inspection program merged into the Fire Department's Inspection program in 2006. This Division provides public fire safety and injury prevention education through outreach programs like the National Fire Prevention Week, car seat safety clinics, school district classroom contacts, community group presentations, fire extinguisher classes, Juvenile Fire Setter intervention, and Smoke Detector maintenance and installation program. Fire and Loss Prevention is provided through a comprehensive commercial fire inspection and storage tank inspection program. This program also provides for the record keeping for all commercial properties for fire and storage tank inspections. Finally, in this division, we identify fire origin and cause determination.